Congratulations! You have decided to become an omnipotent creator of worlds! Destroyer of… hopefully nothing, but we’ll see how green that thumb is. In our second post on these pocket-sized ecosystems we’ll go over what you need to become a terraforming superstar and how to go about it. Previously we discussed the key differences between open and closed terrariums (short version: open is for dry sun exposure and dry sun-loving plants, closed is for humid shade exposure and humid shade loving plants). 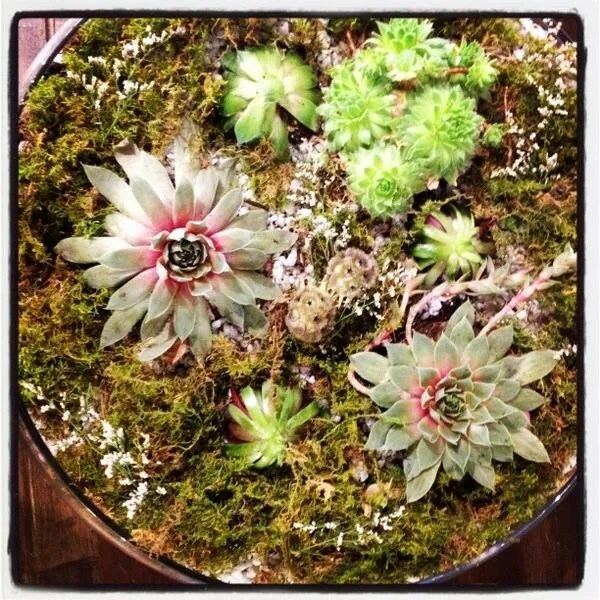 In each of the following steps I’ll explain further the differences between the two when building your terrariums. 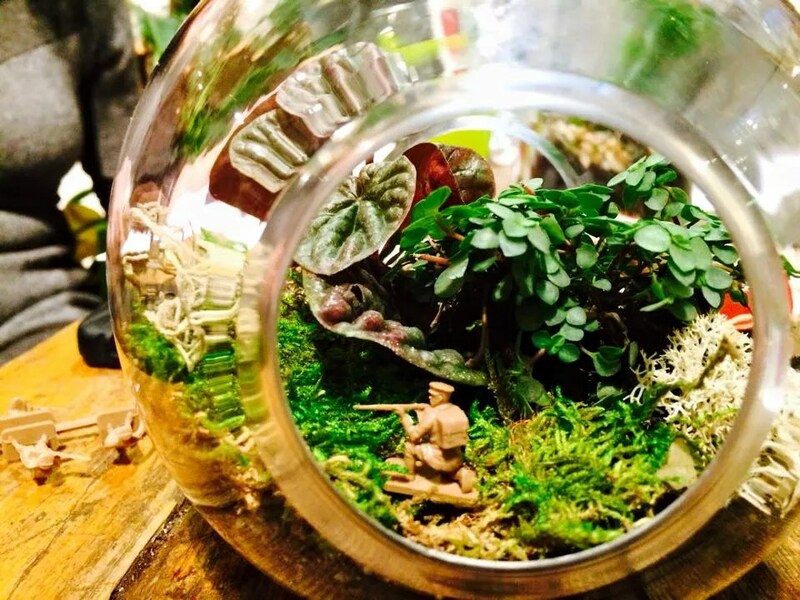 The container is possibly the most important piece of your terrarium and should be chosen based on the plants you would like to use, the location in your home that you would like it to live and your own experience and knowledge of plant care. A mostly or entirely closed terrarium is one that has either a very narrow opening or a lid that allows you to completely close off the environment. The lidded variety can be rather tricky to figure out as the extreme delay in water evaporation can lead to too much humidity and can cause root and/or crown rot and mold. We recommend for beginners a mostly closed container that has a fairly small opening (~4-6”) across. These will trap enough humidity to allow easy regulation without leading to a swamperrarium in the event you accidentally overwater it. Remember that you’ll need to be able to fit your plants and probably hands in to set it up, so not too small. Summary – Mostly closed terrariums are best for areas that don’t get full sun, plants that like high humidity, people who like to keep a close eye on things. An open terrarium is a bit of a misnomer as it’s really just a bowl. A planted arrangement of cacti and succulents that enjoy the full hot sun can’t really stand the intensified heat that comes from sunlight magnified through glass so you only want your container to be deep enough for the planting material plus maybe an inch or two for a decorative wall. Sloped and angled containers work well as you can turn the higher wall so it’s not in between the sun and the plants. Summary – Open terrariums are best for areas that get full sun for at least part of the day, plants that like heat and to dry out, people who will forget to feed something unless it can ask you to. Both types of terrarium have the same basic steps of construction with some changes to the type of materials used. 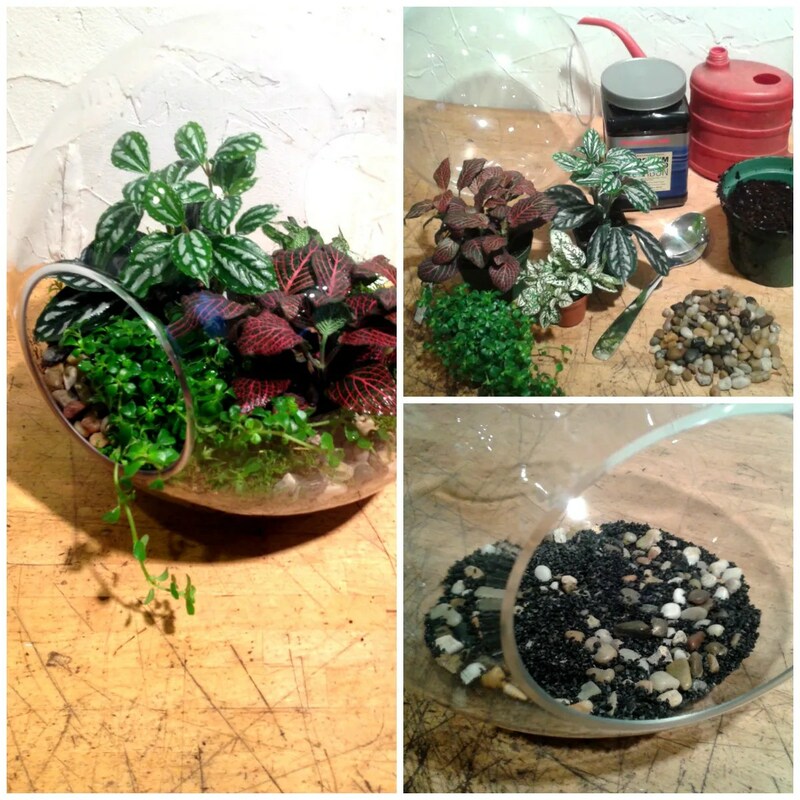 Because terrariums are typically built into glass containers with no drainage, a good layer of pebble or gravel is needed to allow excess water to drain from the soil. For most sizes an inch or two is sufficient. A pebble mix of stones ~1-2cm is a good size. Next you should add a thin layer of activated charcoal. Like any charcoal filter used for air and water this helps to maintain a nice clean terrarium, discourages mold and bacteria and helps prevent any smells from developing. You only need a thin layer, you should still see the pebble layer through. You can find activated charcoal from most garden or aquarium supply stores. The next step is different depending on what type of plants you are using. For those plants suited to a closed terrarium a standard tropical potting mix is fine to use. For succulents in an open terrarium you can use a specialized succulent mix or cut tropical potting soil with sand using 1:1 ratio. You can also find specialized pre-mixed cactus soil or use plain sand with just a bit of tropical soil mixed in. About a 4:1 ratio. Spread a shallow layer of soil mix over your pebble and charcoal, about ½”-1” deep. Pop your plants out of their pots and arrange in the container in a way that pleases you. If your container has a back to it, try to keep shorter plants to the front so the taller don’t overtake them, if it’s all-around, keep the taller in the center so they don’t block from any side. Using a small trowel or spoon fill in the spaces between the plants until the soil level is flush with the tops of the pot soil. Too low and watering may expose roots and too high might lead to the stems rotting under soil. Gently tamp down the soil mix to make sure they’re snuggly tucked in, you don’t want any shifting when you water. It’s always best to water plants right after transplanting to help settle the new soil. Be careful at this point to not overwater. You want just enough to saturate the soil without any excess run-off. The transparent sides will help you with this. Water in small amounts around the container and allow some time for it to soak in. When the top and sides have become evenly moist without any extra running down into the pebbles, stop! A mister may help in a really small container. (Mostly)Closed Terrariums: keep out of direct sun, don’t let them dry out. 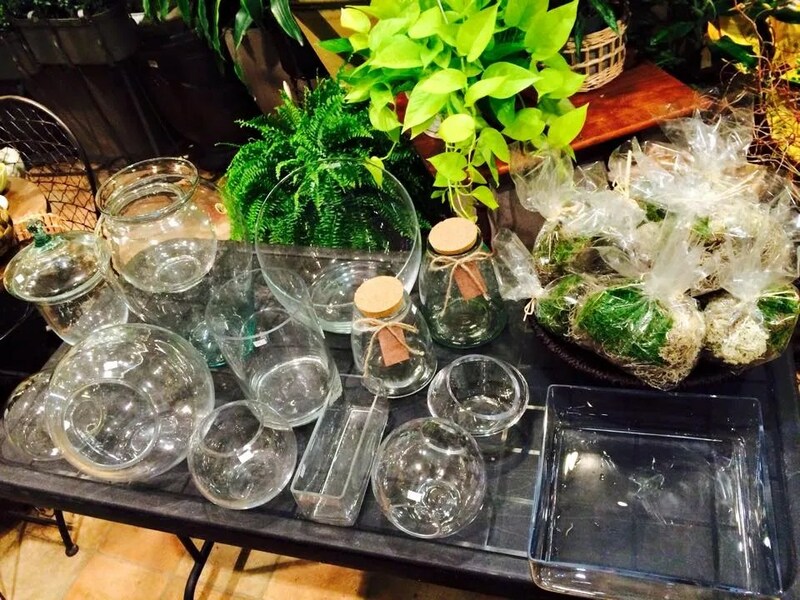 Open Terrariums: Do the opposite.